Adopt a Kitty with Special Needs This Holiday!!! Loving Lela has the unfortunate fate of having been diagnosed with diabetes, which is sadly why she was surrendered to the shelter. But it’s a very manageable disorder. But Lela doesn’t like other cats as much. James said she’s gotten better since his household went from eight cats down to six. So Lela would probably be ok with a house that has only one or two other felines. One of James' own personal kitties is diabetic, so he’s familiar with their care, including scheduled feedings of a prescription diet and injections twice a day. But Lela and James both assure you, she is VERY worth it. 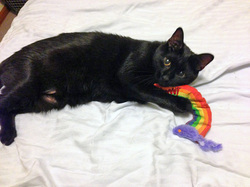 If you’ve ever wanted to be adored by a silky soft kitty, she’s the one to adopt! The students at Polaris and Lab are currently raising funds to purchase a JamHub and Electric Drum Set. The JamHub is a piece of equipment that allows a rock band to practice with each other wearing head phones. This allows more groups to practice in the music room simultaneously. Performance fundraisers are done throughout the year and donations are readily accepted in the front office anytime. Jasmine Faulkner, music teacher, at Lab & Polaris Expeditionary Learning School, K-12th grade.